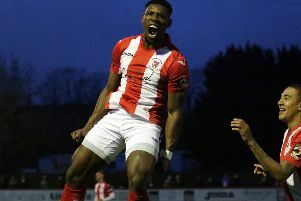 Brackley Town extended their unbeaten Vanarama National League North run to seven games with a deserved 3-0 victory over Bradford Park Avenue. New recruit Carl Baker bagged a brace on his home debut and top scorer Lee Ndlovu, with his 15th of the season in all competitions, got the goals as Saints moved up sixth place. Avenue arrived at St James Park in third place but went away empty-handed following an impressive display by Kevin Wilkin’s side in Saturday’s contest. 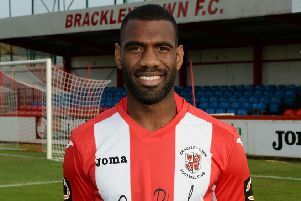 Steve Drench got a hand at full stretch to divert Omari Sterling-James’ early effort but Baker set the home side on their way with a 25 yard shot beyond the keeper in the 24th minute. Saints threatened to increase the lead as Matt Lowe’s shot was saved by Drench and Jimmy Armson’s effort was blocked. But it needed captain Gaz Dean’s saving tackle on the stroke of halftime to deny Jake Beesley and send the sides into the break separated by the single goal. The visitors rarely posed a danger to Danny Lewis in a second half dominated by Wilkin’s side. A superbly worked second goal on the hour mark, with Baker and Shane Byrne combining on the left, presented Ndlovu with a close range header. The points were sealed when Baker fired in off the bar in the 78th minute after fine work by Matt Lowe to bag his second goal of the game.